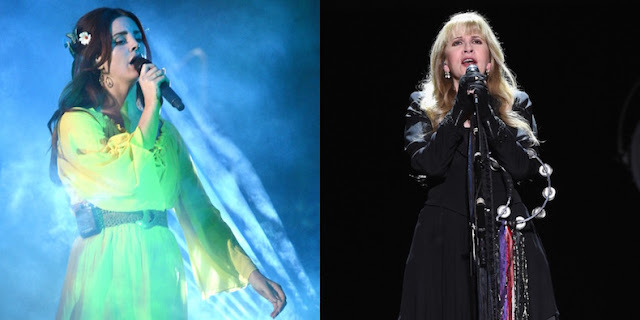 Ugh - figures Stevie can find the time to show up for Lana's latest shitfest but can't get it together to do 1 lousy song for Fleetwood Mac. I'm done. Lana is amazing. She's gone in a different direction on her few past records. "Lust For Life" is supposed to be a companion piece to her second, biggest selling record, "Born to Die." So far the first two singles, "Lust for Life" and "Love" (probably the best song of her career) have done extremely well. Lana's releases ALWAYS garner lots of attention from the press so that's a plus for Stevie. HOPEFULLY the song will be the next single and maybe she can pull a few strings and get Stevie in the actual video. LOTS of similarities between these two ladies! Lana is jimmy iovines great project. I'm sure he keeps his girls on the shortlist! Jimmy Iovinne is a huge part of the legacy of Stevie Nicks astounding solo career. I'm sure she is participating both for Jimmy and Lana. Her Svengali! I agree with majority of your post...except for "surpasses the legend of fleetwood mac"
She has the most successful solo career out of the 5 of them, I'll give you that. However, she has never been inducted into the Hall of Fame, except as a member of that legendary band. She herself has said that the Mac's albums outsell hers, and that she cannot fill the huge arena/stadiums that they 5 can together. Im not saying she isnt a legendary icon, I am saying Fleetwood Mac is more than a sum of their parts, and when they are together its just magic. Wow I think you overestimate her place. Half the stuff you said made me laugh. The song is called "Beautiful People" - it'll be released next Thursday (May 25).